Slacklining became popular during the mid-1970s in climbing camps at Yosemite Park. Climbers used slacklines to explore the park low and high for a new adventure in the same area offering weeks of excitement if not months. 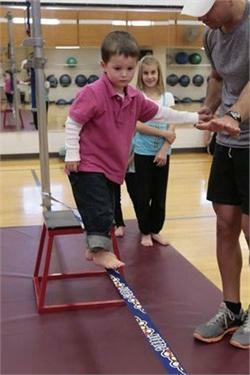 They began rigging their climbing ropes to walk across for an easier journey and discovered that this new sport gave them more balance, core strength, made it easier to move about and was just fun. 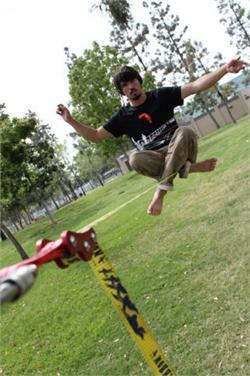 The sport of slacklining is to maintain balance along a flexible and narrow piece of webbing low to the ground and tethered between two hard objects, such as trees. 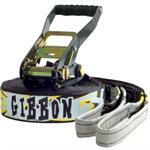 This sport once was only accessible to climbers but as it has grown in popularity, the world has been introduced to the fun Gibbons slacklines offers. 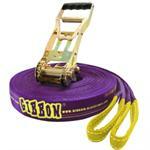 The specific design allows the slackliner to easily walk across (with a little practice) and comes with an easy set up. No additional tools or rigging. All you need to get started is a kit and two trees (24" round with thick bark) or equally strong pieces of equipment and you are ready to start slacklining on your own! 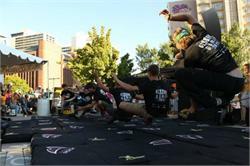 The jib and surfline is made a trampoline material to give you the same effect of bouncing on a normal trampoline using a smaller surface and has led to the creation of the sport known as tricklining. To protect the trees, use a thick material with little to no chance of slipping to wrap around the tree during use of the product. It is suggested to use carpet remnants, car floor mats, corrugated cardboard or foam camping pads.